What’s the most important element in the modern marketing arena? While past responses may have ranged from quality content to a well-oiled sales funnel, that’s no longer the case. The most important element today is the voice of the customer. Here’s why. Ever since inbound marketing started gaining ground in 2008, consumers have been facing a content explosion. This overload of information has taught consumers to tune out content the same way they’ve trained themselves to tune out irrelevant ads or spammy emails. Only the most meaningful information is powerful enough to rise above the rest of the noise, and that meaningful information is the voice of the customer. People are listening to what other customers have to say. Some may not even give your business a second glance unless it comes backed by customers raving about how phenomenal you are. The most effective way to produce customer delight is to, well, make sure customers are delighted. This means creating an exceptional customer experience that starts the second people become aware of your business, continues after the sales process, and lasts for the duration of your entire relationship. That’s where the traditional sales funnel fails. The traditional funnel moves customers through a linear journey, with the journey regarded as complete once the sales team closes the sale. Instead of paying attention to ongoing customer delight, many companies tend to immediately move on to the next prospect once a sale is made. The flywheel isn’t linear. Rather than having a distinct start and finish, it’s an ongoing process with three stages. Each stage contains a series of cycles, or set of experiences, that help the buyer move from one stage to another. Once people move through all three stages, the journey isn’t over. The process starts all over again. People don’t typically move from cycle to cycle in a set order. They are instead influenced by environmental factors that impact them along the journey. These factors can include your marketing efforts, your sales team interactions and your customer service – and they also include what others say about your brand. 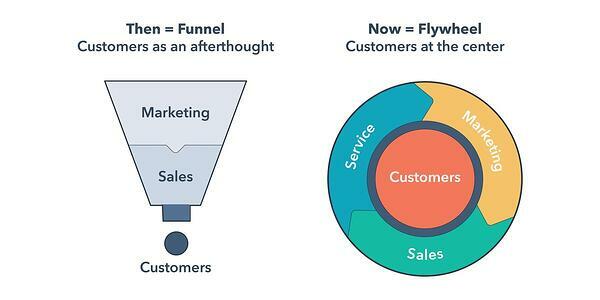 Unlike the traditional funnel, the flywheel continues to pay attention to customers even after the sale is made. This helps to ensure you not only get a chance to introduce new purchasing opportunities to existing customers, but you get a chance to deliver customer delight for the duration of your entire relationship. Due to the need for companies to significantly increase their content marketing efforts, customer acquisition costs have risen by 50 percent over the past five years alone. Content marketing remains one of the least expensive ways to attract customers, but it’s no longer effective as the only way to bring people in. Add customer delight to your marketing mix, and you’re tapping into the power of word-of-mouth referrals that come from happy customers. Word-of-mouth referrals are considered the most reliable source of information in many industries. Customer delight also involves prioritizing inbound efforts that help the customer, which are less expensive and more popular than many other types of content. So how do you add customer delight to your marketing mix? HubSpot Service Hub was developed to achieve exactly that. The focus of HubSpot Service Hub is creating the optimum customer experience within every cycle in the flywheel. In the modern marketing arena, the goal is to open and maintain relationships by providing exceptional user and customer experiences. Happy customers are repeat customers who recommend and praise your company, creating new happy customers in their wake. What Can a HubSpot Integration Do for You?